The birthplace of trend setting furniture, a perfect milieu for design enthusiasts, an inspiration for architect's next design, Salone del Mobile 2018 also known as Milan Design Week is fast approaching. And we are excited to share what you can expect at the world's biggest furniture event. The 57th edition of the fair for the first time in history will have a Manifesto. The Manifesto dictates calling for the city and the design industry to promote innovation and sustainability at this year's event. It is a declaration of intent geared to channelling the forces in Milan to work together to preserve the leadership role of both the city and the trade fair. The Manifesto calls for architects, designers, and brands to pay attention to the circular economy, respect Milan's architectural development, encourage sharing of ideas, and champion the work of young designers. The eight pivotal points Emotion, Enterprise, Quality, Design, Networking, Young people, Communication, Culture, and Milan At the Center are the cornerstones of the Manifesto and are not aimed at upsetting the foundations of the system. These values promote its virtuous action by imposing the lovemark Salone as an effective experience that works better and better than others. This year the five exhibitions will be held concurrently from Tuesday 17th to Sunday 22nd April at Fiera Milano, Rho. Salone Internazionale del Mobile and International Furnishing Accessories Exhibition – split into 3 style categories: Classic: Tradition in the Future, Design and xLUX – will be joined by the biennial EuroCucina – plus its collateral event FTK (Technology For the Kitchen) – and International Bathroom Exhibition, as well as SaloneSatellite. In its 29th edition, this exhibition is split into the three categories: Classic, Design and xLux. Classic: Tradition in the Future, draws on the values of tradition, craftsmanship and skill in the art of making furniture and objects in the classic style; Design, products that speak of functionality, innovation and boast a great sense of style and xLux, the section devoted to timeless luxury re-read in a contemporary key. The Design category is the most robust, with more than 800 exhibitors unveiling the latest in bedrooms, dining rooms, hallways and furniture, among many other things. xLux and Classic, meanwhile, have 218 and 270 exhibitors. The most influential names in kitchen design converge at Eurocucina, a forum geared toward all things high-end. Now in its 22nd year, the event, which has 111 exhibitors, will unveil the future organization and evolution of the most strategic environment of our house, increasingly ‘fluid, orderly and professional’. The event displays prototypes, models and appliances, explores the evolution of where we eat, what we eat and how we eat. The opening out into the living room is an established trend with modular containers and concealed work stations that appear only when home chefs need them. Materials and finishes: natural stone and coverings that replicate it, as well as wood and metal, are back. Colours reappear, also in very bright hues like purple and green. This year, Eurocucina and its accompaniment, the tech-geared FTK: Technology for the Kitchen will showcase built-in appliances that are increasingly connected and integrated. Smart Kitchens require efficiency, sustainability, consumption control, safety and ease of use, as well as entertainment. There will be also innovative in-home solar panels and ideas for water management in the kitchen. You can expect to find modular additions, islands and items that can transform a kitchen from workspace to theatre. Once a strictly utilitarian zone, the modern bathroom has evolved to become a space of wellness and relaxation – and it’s becoming increasingly eco-conscious and digitally savvy. Expect to find ethically responsible products here, ranging from sanitary anti-bacterial surfaces, sustainable materials and digital tools aimed at reducing water and energy use. The exhibition will host 228 booths. Tomorrow’s design stars seen today, an event that focuses exclusively on the work of young designers. Around 650 designers from the world’s leading design schools will be participating in the event. The focus will be on combining heritage with contemporary design. This year the theme assigned to the selected talents is “Africa/Latin America: Rising Design – Emerging Design”. The intention is to bring popular design into the limelight and point out what is on offer today or what we can expect to see in the near future in terms of solutions to social and environmental emergencies and an informed future lifestyle. A pavilion developed by Ratti’s design and innovation studio, Carlo Ratti Associati. As visitors enter the five-metre-high, 500-square-metre installation, they will traverse side-by-side climactic microcosms emulating each of the four seasons. The pavilion is made of a crystal membrane with light-reactive sensors, while its roof is outfitted with solar cells, which generate the energy required to heat the pavilion. Living Nature. is designed to explore whether or not a space, urban or domestic, can become more human-friendly through the sustainable use of natural resources. During the Fuorisalone, many locations often become a co -protagonist of the event. Many important brands located in the design districts introduce their new collections and host special events with live music and entertainment. Although the events are usually scattered throughout the city, the Fuorisalone recognizes a series of main districts, namely Porta Venezia, San Babila, Tortona, Ventura Centrale District, Brera Design District, Isola Design District, The 5 Vie, Sant’Ambrogio or San Gregorio, Triennale. This is the basis of what you can expect from the Milan Design Week. The fair gives one a perfect opportunity to get to know the city and to discover the latest news and trends of International Design. Simply Sofas is covering the event live so you can get the insights into the latest world of design as it happens. Better more, an inspiration for your next interior project. Follow the hashtag #DesignSoGood to get the live feeds on latest trends and designs. Summer time is when we invite many outdoor activities. You may fancy a roof top restaurant you saw somewhere or an open air pub or a gig. But, you can enjoy the same entertainment at your home by taking the amusement to your backyard, balcony or patio. It is easy to do it in style and comfort with the right outdoor furniture. 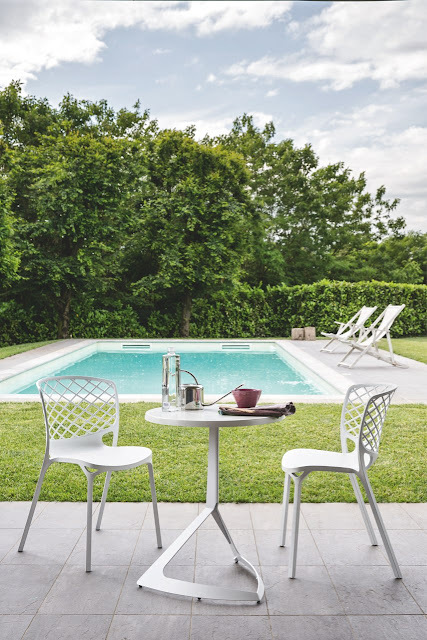 Our finest collection of outdoor furniture will fulfil all your Al fresco fete. Arianne Garden by Fama is one such piece that matches your needs if you are looking for a weather resistant and low maintenance product. The fabric is waterproof with a polyethylene base. The modular system allows it to be placed together, individually or creating different shapes to adapt to your needs. The back folds down to create a table and at the same time encases the cushions so that they are protected from all weather conditions, family pets, and the like. The base is available in seven colours. Inspired by nature, this sofa offers great comfort and versatility. If you're thinking of putting up a dining show in your backyard garden space or in your spacious balcony, we have a wide range of dining tables, coffee tables, and chairs to spruce the setting. There are few tables we like to mention, both functional and flexible. 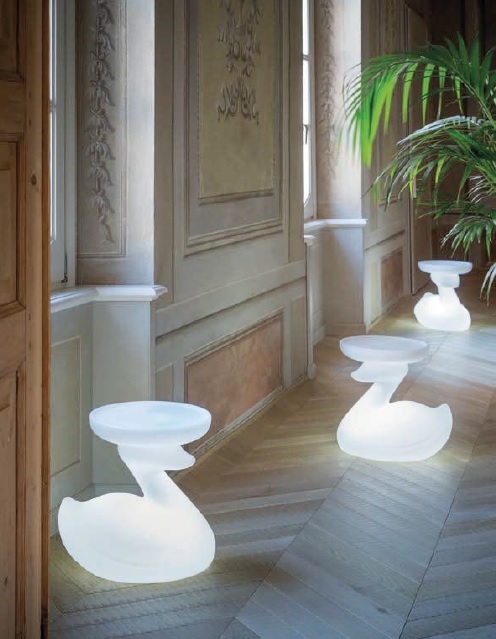 TheDuck by Bonaldo is a coffee table with a duck-like base, making the ideal piece for an outdoor setting. Matrioska by Tonin Casa is an unconventional coffee table with storage units. Other worthy mentions include Tonin Casa's Amira, Bonaldo's Planet, Orion, Kadou coffee and Assemblage. When it comes to chairs, we look for only one aspect – comfort. Bonaldo's Eddy chair designed by Alain Gilles and Swing rocking chair are a recreation of rocking grandpa/grandma chair as most people call it. If you have a brighter side to your personality, we are quite sure you prefer colourful furniture. Our wide range of outdoor chairs that can be used in living and dining as well are durable and do not require maintenance. Some of the worthy mentions include Calligaris' Ice, Hero, Area 51, Wien, Bonaldo's Birba, Pebble pouf, Tonin Casa's Batik stool, Aria, Hole, Sorbona, Zar. If you are not the chair type and prefer a classic style bench, our Becker bench will do the trick. The most surprising thing about this piece is that it swings or rocks (however you want to call it). We also have a dining set that goes along with the bench set up. Classy and trendy. And of course, summer is the apt time for rooftop, parties, lounging by the pool, entertaining friends, and BBQ's. 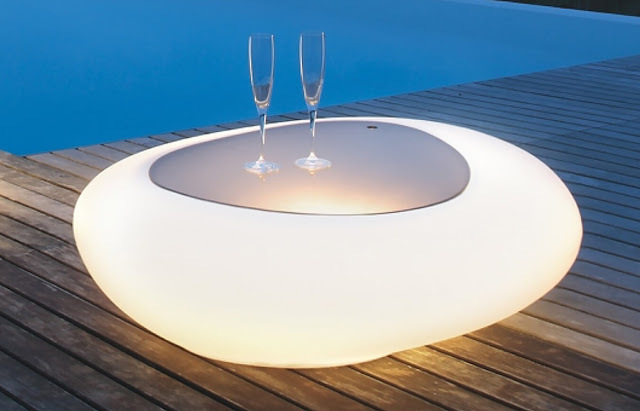 Tonin Casa's KOS and IOS are the perfect additions to your pool side set up or garden setting. Both these tables have a storage unit for drinks and have the option of LED lighting for the base which makes a one-of-a-kind. For cocktail, mocktail parties, Bordbar's bar cabinets are quite essential and useful for your liquid retreats. You can not only store bottles, but keep them chilled. You may have many ideas for your dream patio or backyard soirée and we have a plethora of outdoor furniture options to customise and fulfil your summer dream ecstasy. So you can sit back and enjoy the moment till the summer lasts.